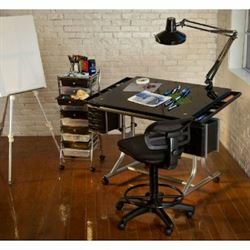 The CraftMaster II Glass Top Deluxe workstation is a striking addition to the Alvin CraftMaster series. Whether using for art, drafting, or hobby, the NEW CraftMaster II Glass Top Deluxe is a work of art. This table comes equipped with all the bells and whistles, providing its user easy access to all the tools of his/her trade. Features two full-sized and compartmentalized side storage trays with removable covers and two 4-drawer storage units (one of each on both sides). The sleek 28" x 40" work surface is constructed of black tempered glass and reinforced from beneath with a ¾" x ¾" steal frame running the entire perimeter of the top. The CraftMaster II Glass Top Deluxe is angle adjustable utilizing dual, quick-release tilt mechanisms, that lock into position with one hand. This table is also height adjustable and firmly locks into distinct horizontal positions on four large diameter uprights. The hefty cross member between its vertical support legs, combined with the rubber-treaded footrest,provide added stability. Each table is equipped with four casters (2 locking), as well as floor glides, depending on one’s need for mobility. One-hand dual tilt mechanisms adjust work surface from 0° to 30°. Height adjusts 27¾" to 32¼" in the horizontal position using casters, or 25¾" to 30¼" using floor glides (both included). Left and right storage trays are each 4" wide, have an assortment of compartment sizes, and include removable covers. Two sets of 4-drawer storage units, each 7¼"w x 9½"h x 10¼"d. Plastic pencil and tool tray (297/8" length) included. Sturdy steel construction with powder-coated chrome color finish. Footrest crossbar with rubber tread and spacious 29" of leg room for comfort. Tabletop and base packed securely in one carton, ships by truck.